We have covered a free little app before called SimpleNote. It was just a high level mention in a more detailed notes post about another option. In a recent hallway chat, we discovered that it is actually getting used more than we have thought so we should mention it in more detail. 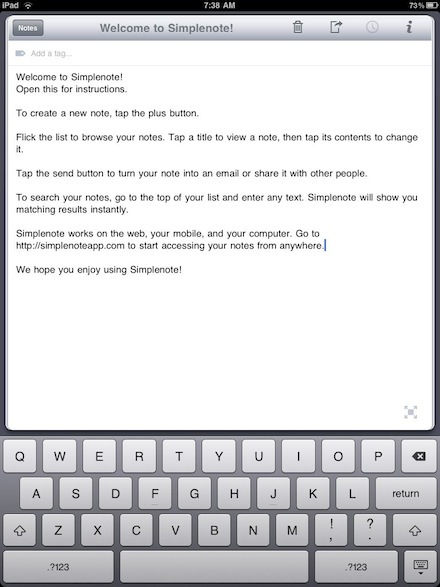 The SimpleNote app is a universal free app. When you use it to enter a note, it is automatically synced up to the SimpleNote cloud. This allows your notes to be accessed through other iOS devices and a Web interface. 10 versions of every note is backed up so when you edit just a little too fast, you can go back and find what you didn’t mean to erase. 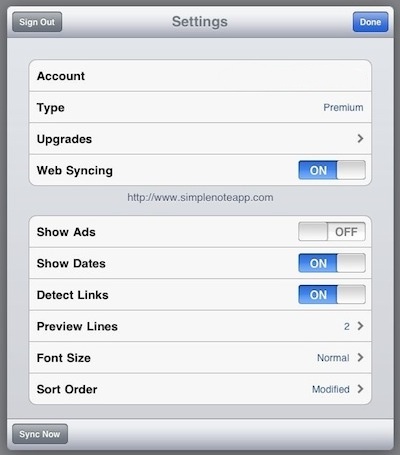 SimpleNote does need Internet access to sync across devices so it popular for iPad users in the office and mobile iPhones. New to us is a Mac desktop app called Nottingham that goes beyond what SimpleNote offers by having your notes on your computer too. A core feature of SimpleNote is ‘tagging’. Using tags on every note means project groups are quick to reference. Even though the app is called “SimpleNote“, you can get a lot of text on a page. There isn’t fonts and text adjustments available so the actual text is truly simple. Size allows for a quick thought about a project to a full rough draft of a letter or presentation. Information about the notes is available: total number or Words and Characters. 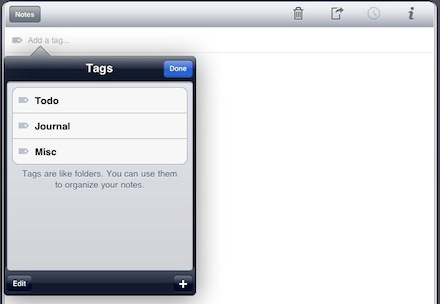 ‘Pin To Top’ will make that note go to the top of the list of your notes in SimpleNote. A great way of creating a reminder to use in a meeting your heading into. The SimpleNote settings area is for setting up the cloud account for sync and backups. If your notes are for all to reference, you can push your notes to a Web site for public viewing. As well, the note and list defaults can be chosen here. The free version of SimpleNote does have ads on the screen, which can be removed by paying $4.99 or by going with a ‘premium’ upgrade. The upgrade gets you more than just the removal of ads, you also get 30 levels of back ups, DropBox storage/share, new notes can be created via email and even a RSS feed. 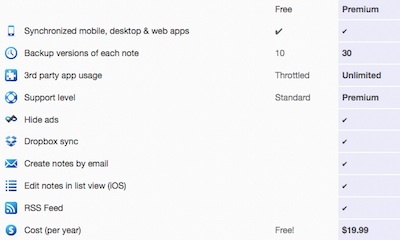 The premium is not a one time charge, rather a yearly subscription.